Someone pays the price for every choice. With labor, food can be made; with money, food can be purchased. But where does money come from? 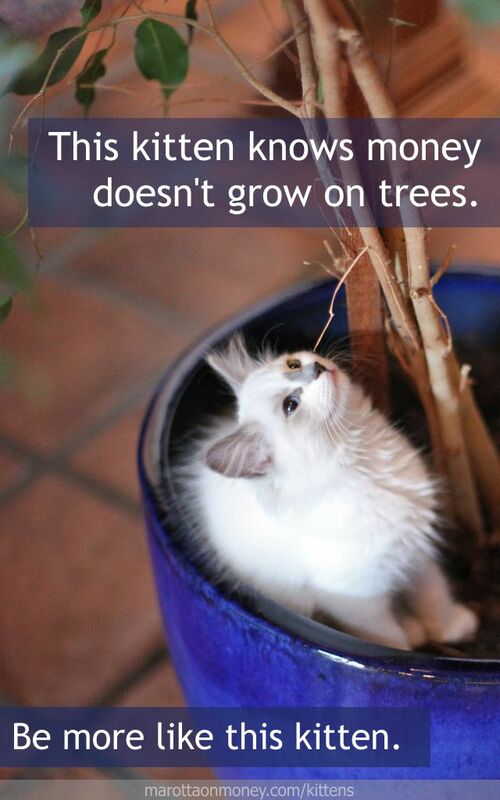 This kitten understands that money doesn’t grow on trees. She knows that every method of acquiring money requires effort because money is just a placeholder for labor not yet rewarded. Imagine that in the days of the barter system, a website designer wants to buy a chicken. That website designer would have to use his trade, making websites, to earn a chicken. For example, the website designer might have to make a website for a painter who then paints the fence of a chicken farmer who gives the website designer a chicken. Luckily, we’re not in the barter system now. Now-a-days, we allow labor to go unrewarded for a time in order to expedite the economic process. We pay for things in a paper representation of labor rather than the labor itself. Thus, all money is earned either through labor completed or the investment of unrewarded labor. As a result, this kitten works hard for her money. Read all the Kittenomics here! Photo of one of Snowy’s kittens taken by Steve Jurvetson and used here under Flickr Creative Commons.